Not just a great name for a 1970s movie! Some things just belong together, like chocolate and peanut butter, or peanut butter jelly and a baseball bat, or that song and your head. Proving there's no finer pair than coffee and hot dogs, Avoca and the Wiener Man. 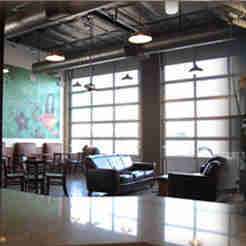 Avoca: Situated in an industrial-idyllic South Fort Worth warehouse, Avoca offers an evolving selection of foodstuffs from the likes of Artisan Bakery (bacon/ cheddar/ chive scones), Dude Sweet Chocolate, and Le Chat Noir Cupcake Bordello, plus espressos, pour-overs, and lattes honed by family-coffeenerdness that stretches back five generations. All beans are sourced directly from farms around the world (from Kenya to Sumatra to Columbia), which they mix and match to brew their own roasts, putting their unique stamp on things, and sparing them a tongue-lashing from Comedy Central's Lisa Lampanelli. 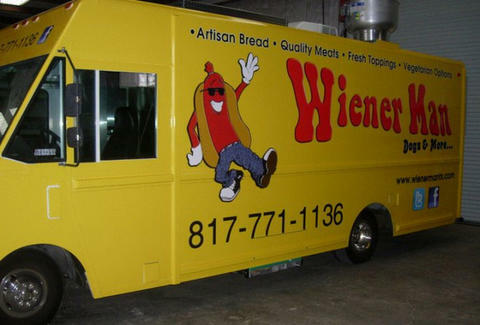 The Wiener Man: Parked right next door starting May 2nd, this truck slings (relatively!) healthy all-beef hot dogs served in Empire Bakery egg-bread lobster rolls, topped with things like mayo-free slaw, home made chili, pico de gallo, and Gouda sauce, and of course wrap-able in bacon. They're also veg-friendly (a portobello dog w/ Gouda & spinach), and offer up sides like chili-cheese handcut fries; real-sugar-tastic drinks include Dublin Dr. Pepper, Mexican Coke, Texas Tea, and Maine Root: "free-range root beer" sweetened with crystallized cane juice -- as given his temper, trying to collect Kane juice would mean getting paired up with The Undertaker.